Rising interest rates, increased competition for deposits and CECL implementation are among the issues that will be monitored closely by bank supervisors in the coming months, the Comptroller of the Currency revealed in its latest Semi-Annual Risk Perspective. The OCC noted that “untested depositor behavior,” coupled with changes in technology, will make it difficult to forecast liability costs. Bankers should also be aware of easing commercial credit underwriting practices, the need for sound CRE concentration risk management, and the strategic and operational risks that may accompany CECL implementation. 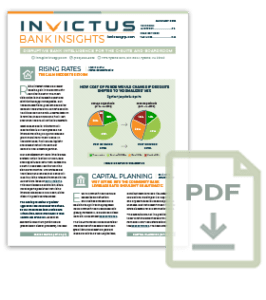 Community banks especially must be aware of how liquidity requirements for the largest banks may increase competition for stable insured retail deposits. The Federal Deposit Insurance Corp. is reviewing whether its rules for brokered deposits make sense in today’s ever-technical banking environment. It wants to know what issues have changed since the FDIC began regulating brokered deposits in 1989, whether it collects enough information on Call Reports, if the interest rate restrictions are still valid, whether the right types of deposits are considered brokered, who constitutes a broker, if rates make sense and if banks understand the rules correctly. About 41 percent of all U.S. banks hold brokered deposits. The Financial Accounting Standards Board held a late-in-the process roundtable to consider an alternative approach to CECL, but don’t expect much to come out of it. The board issued a 16-page defense of its eight-year deliberative process on the new accounting standard, before listening to banks argue for changes. FASB staff in January also released a Q&A on whether banks can use the WARM method—a methodology that should raise red flags with SEC filers, according to a blog post from Invictus Group CEO Adam Mustafa. The OCC, the Federal Reserve and the FDIC have finalized rules for allowing more community banks to qualify for an 18-month exam cycle. Qualifying institutions with CAMELS ratings of 1 and 2 that have less than $3 billion are now eligible for the longer cycle. No banks failed in 2018. But de novo activity is also low—and the FDIC wants that to change. It points out that only 11 banks have opened since the end of 2009. Prior to the recession, the only time fewer than 20 new banks opened in a single year was 1942, in the middle of World War II. The agency has issued a request for information seeking comments on how to improve the deposit insurance application process, published a handbook for investors and speeded up the process for reviewing applications. According to its website, two applications for deposit insurance were approved in the first half of 2018, one was returned and three were withdrawn. It took about six months to process each application.